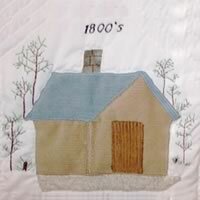 In 1987, members of the East Point Woman’s Club stitched together a quilt to commemorate East Point’s Centennial. Each of the 49 squares helps tell the story of East Point’s history. 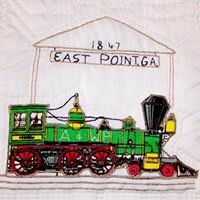 The quilt is on display at the East Point Historical Society. 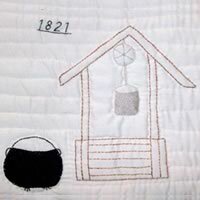 This is the first in a series of East Point history lessons, as reflected in a sampling of the quilt’s squares. The land that East Point now occupies was Creek Indian territory until 1821 when the Treaty of Indian Springs transferred ownership to the U.S. government. 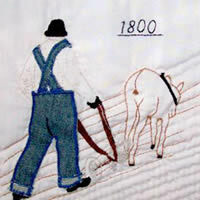 East Point’s settlers farmed and developed industries related to agriculture from the very beginning through the late 19th century. 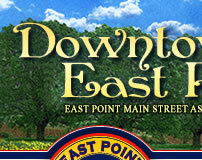 The town that was to be known as East Point was the result of a strategic location where two railroad lines intersected. In 1847, the Georgia legislature chartered what was later named the Atlanta and West Point Railroad. East Point was its eastern terminus, where it met the Central of Georgia line that ran between Atlanta and Macon. 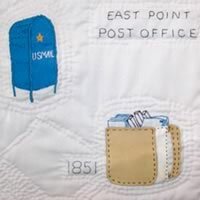 In 1851, East Point gained official recognition with the establishment of a U.S. Post Office. Farming and industry related to it grew around the railroad terminus. After the Civil War, East Point experienced a rapid growth in industry and housing for factory workers. Atlanta’s demand for suburban development spilled over into East Point as well. By 1887, this expansion warranted East Point’s incorporation by act of the Georgia Legislature. 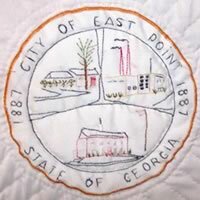 This design of the city seal features East Point’s City Hall, its industrial base and housing opportunities.